Habitat: Desert. 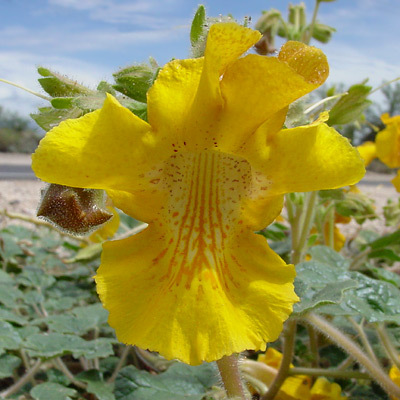 This summer wildflower grows in dry, sandy, open areas. Description: The flowers are broadly tubular, up to 1 3/4 inches (4.4 cm) wide, and have 5 ruffled, partly reflexed lobes and a red-spotted and red-lined throat. The flowers are followed by long, green, tapered fruit with a single curved "horn" that splits in half when dry to form 2 woody "claws". 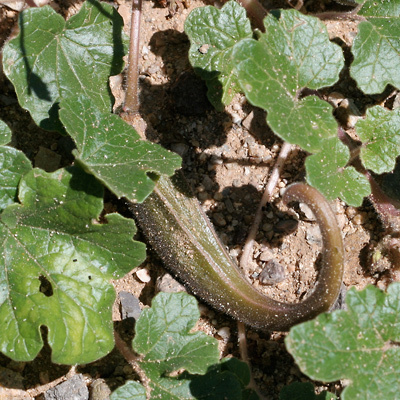 The leaves have scalloped edges and are green, hairy, lobed, and round to kidney-shaped. 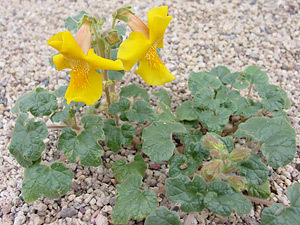 The stems are pale brownish, hairy, decumbent, and spreading. The plants are covered in sticky hairs.